Can I translate the site into my language? Yes you can! When you set your language in WordPress from English to your native language, if there is an available translation in your language it will automatically switch to your language. Soon I will release a video on how to manually translate the template. I already have hosting, can I still use this template? While I strongly urge you to use InMotion Hosting, if you already have hosting you can still use this template. If you begin to have problems because of a budget web host you are using, then I really won't be able to assist you though. This all seems too good to be true. How come it's free? Well for starters, I have spent over 300 hours putting all this together for you, and have spent my own money on the finishing touches, but yes it is free. To thank me I appreciate if you would use my recommended page to purchase themes and plugins, also please share this page on your social groups. If you have a question that is not answered here, feel free to live that me and I will be more then happy to answer it. Commonly asked questions will be added here from time to time to make things easier for everyone. matters and that differentiator from one W.
Finally download the templates. Thanks very much! The download link should be working right now. Heyy I have downloaded and customised this website as i wanted. But I am designing it for someone else and I have hosted it on localhost. I need to send the design to the concerned person but i have no idea how to do that. Can you please share how you made that dfy template so that I can make the same and send it. You just need to migrate it to where you are going to host the website. There are several migration plug-ins, you can use the one you installed to restore this package if you needed to. You can add a menu link to it. Adam, thanks for a very helpful tutorial. There are a couple of things I’d like to try to change. mostly, spacing. The spacing on the menu and the text box under the title pic is way more space than I need but I can’t make it fix the text. Also, is there any way to set the delay on the testimonial scroll, several of my comments are long and require more time to get through them than provided. If you do a search for CSS on my site you will find a few tutorials. Essentially you need to customize that with CSS. hi another follow up email, if there are multiple locations where I would need different menus, is there a way to create multiple menus? Hi, my dropdown menus are being hidden behind the page, is there a way to prevent this from happening or to fix it? That should work and if it isn’t after flushing any cache, try adding !important to see if that works. I would talk to your web host to see if they allow outbound emails. First of all i want to thank you Adam for you quick answer. PS: sorry for putting the site link, the crappy free web host as you changed it, haha !! Haha, I hope you don’t mind that. I had a REALLY bad experience with them. For managing reservations, this template doesn’t have those features. I am sure there is a WordPress plugin that you can add in for that, but I don’t know of any off of the top of my head. No don,’t worry about it ! lol! Concerning managing reservations, i thought you had it in the template, but it’s ok i’ll look for a WordPress plugin wich can do it. Hi, I haven’t got the food menus sections on the homepage neither dashboard. As instructed in the tutorial video, you have to have Jetpack installed, activated, and connected for those options to be there. Would you mind reallow the download of the template during the time the updated video and files coming? We really frustrated to not be able to start and progress, Adam… Also, I give you a Big Thanks for the time you spend doing all this videos. Bravo! It should be working now. Sorry for the inconvenience. Yes it does. Real consumer care. 😉 You’re doing good bro; keep on going! Every time someone reports this I go and test it myself and it works just fine. Can you try in a different web browser? I am sorry, I have something new on the way. beef pizza, and want restaurant do not over toast the pizza, so does our restaurant theme allow the changes in the order online? This template doesn’t offer that. I have yet to find a really good way to take food orders on a WordPress website. Hello! Sir, I have learned a lot of things from you…….and thank you for all those tutorials.But I want to know that where from you have learned all these things? I learn by doing over the years. Reset your permalinks. It was covered in the video. Hi thanks so much for your great work. I am just wondering is there css that I could put in to make the header height smaller? I have several CSS tutorials on this site. Just do a quick search for CSS. Version 2.1.1 of All in One WP Migration introduces new compression algorithm. It makes exporting and importing 10 times faster. Unfortunately, the new format is not back compatible with backups made with earlier versions of the plugin. You can either create a new backup with the latest version of the plugin, or convert the archive to the new format using our tools here. getting that error while trying to import template…. You have to follow the steps in the video. Unzip before uploading. Amazing free site that gives the most important informations for a non-techie newbie..Two thumbs Up! Great way of making your website, I am interested in your template as well. But the download link doesn’t load. Is it possible for you to provide a link? Also, I’d love to ask you a few more questions about using the All-In-One plugin. Maybe try in a different web browser. HI, Can I change the bottom footer so that it doesn’t say “created with the help of 60-minute website challenge”? I am designing the site for someone else and I wouldn’t want them to see that. I can keep the WPcrafter theme info of course. Sorry if you went over this in the video I watched it twice but so much info I may have missed it. If you do a quick search on my blog for the word footer, you’ll see at least three posts on how to change it. when i click on the lunch, dinner or breakfast, it takes to another page which is not the menu. So what should i do? Did you set your permalinks properly? Hi! Help!I cannot log back onto my WordPress admin panel with the username and password you provided. Hi, I think we got this resolved over live chat? The resolution being just trying in a different web browser. Well you can create a new page and put whatever you need in. In the customizer under Theme Options – Footer, I have unchecked “show site title and description in footer”. I have both the first and second footer widget areas completed, but the first footer is showing up in the middle instead of at the left side of the footer. Is there a way to move the first footer over to the left where the site title would be? I think with the theme, the first column is limited to just the site title and description unfortunately. Great tutorial! You make it look so easy!! I am experiencing the following challenges, and would greatly appreciate any assistance you might be able to give me. This is my first experience using WordPress. 1. Home Page – Open Table Widget – I pasted the EMBED code from the Open Table Reservation site as directed. The result does not show up like the widget preview. I tried two different views, the copy code button and manually cut and pasting the code. 2. Home Page – Footer – Is there a way to put the social media links on the right side of the address/phone number rather than below it? 3. Is there a way to customize the size of text in different areas of the site instead of just the two settings in the customize fonts (headings and base font)? 4. Header – Menus Tab – I set up 3 child pages under this tab for Brunch, Lunch, and Dinner. Under Food Menus > Edit Menu Section – I set up the section name and linked it to the appropriate parent menu. Both the lunch and dinner menu have “Introductions” sections. I started adding menu items, but they are all showing up on the brunch, lunch, and dinner pages. I have two sets of “introductions” on each page even though I marked the appropriate lunch or dinner introductions page that the item should be listed on. How can I correct this and build out the three separate menus? Anything is doable of course, but with this template you have to accept what it is, if you don’t want to hire a coder to make structural changes. Font changes can easily be done, just watch my video on changing fonts. Also become familiar with widget areas and what you can put in them. The template is what it is, its hard to change it without adding code. thank you for you video and template. Please make sure you follow all the step by step instructions. You didn’t reset your permalink as per the video. Could you send me the template by e-mail please? I don’t see that you requested the download. Are you sure you entered the correct email address? When I search on your email address in my system, I don’t see request being made. I did that,but as i told you it just keeps loading and loading so probably the request never comes to you…Now i’m seeing my e-mail and i see that you send me the files (probably manually) so thank you very much. I didn’t send it manually. The system did. Sometimes depending on your email provider, you may have to check your spam folder unfortunately. There’s nothing I can do to prevent this because the email contains a blank and sometimes that is perceived as spam. Still didn’t receive the email? Sometimes it takes a minute or 2. I just downloaded the “template” and tried to import it with the “all-in-one WP Migration” Plugin. But it doesn’t work anymore because the template was made with an older version of the plugin. How can i fix this? Do you have a newer version? Please make sure you follow the directions. You need to unzip what you download from my website before uploading it. This is also covered in the help section on my website. Are your DFY themes responsive? Of course they are and their responsive features are demonstrated in the beginning of each setup video. i downloaded the DFY theme HOW could i install it in them as a child them ?i can see the files are not relating there is _macosx and 60 Minute Website Challenge how could i install to my wordperess site ,, could i use .zip file? Its not a child theme. Its exactly what I show you in the video. I can’t download template resources it does not give even a error it says retry. Thats odd, please try is a different web browser. Can you give me some more info? It is one of the most useful videos I have ever seen before. But I I am so sad that the template can not be downloaded! Thank you, but I am puzzled as to why you would say that its not available for download when there is a download button right there. Probably one of the best videos I’ve seen on building restaurant site, Thanks you very much. How could I put the links to the menu sections at the top of each section? Thanks for the kind words. Regarding your question, you would need to add some custom code to accomplish that unfortunately. It’s not an easy one to implement. Is having the menu itself clickable not working for you? I have set up website by using this video and it is really easy to do it. I have added lots of item in menu section, but I am not able to see under menu section when I clicked. Can please guide me what I have to correct. Hey, I responded to your email. My suggestion is to reset your permalinks. It was one of the steps when restoring everything. I am not suggesting that. I would have to log in to see what is going on. I haven’t had an issue like this, not and anyone else. I like to change the top bar to white color instead of black. In addition, I like to change the color of the menu from white to a different color so people can see it. Thanks for the CSS code! Is there also a custom CSS to change the background color of the Body e.g. the background of the food menu? I don’t have it offhand. So you are wanting to change the background color of the page that has the full menu? Is it possible to get the food menu for another theme? I am using the Sydney theme. Thats only for this theme, sorry. Quite a bit of customization went into it. Came across your site while researching how to get my animal shelters webpage back online. I had been using microsoft’s software, but through some screw ups I lost the grandfathered ability to have them host the site, so figured it was best to find a better way to go. I am very technically challenged, but wordpress seems the way to go and with your frontloader I think I could manage. Can you direct me in the best possible solution for an animal shelter? You can check out my 2016 template. It is very popular. 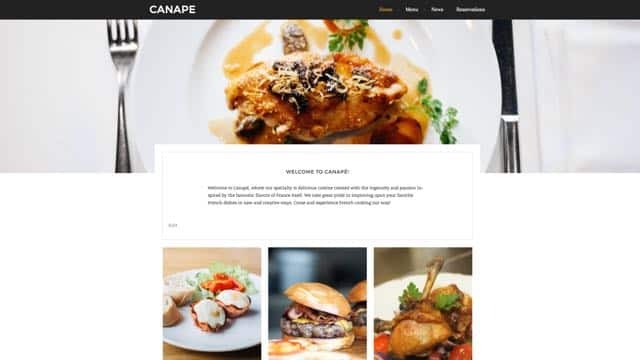 I use the ’60minutewebsitechallenge’ theme, which is a child theme of Canape. On menu page, whenever I click on breakfast, lunch or dinner, it doesn’t take me to the menu page. Please guide me how to make a link on this issue. Haven’t hear of this issue. I clicked through to your website and I didn’t see the home page where you are experiencing this. I also use the ’60minutewebsitechallenge’ theme, which is a child theme of Canape. My question is whenever I click on the image of Lunch, it didn’t direct me to the breakfast menu item; instead, it comes up a page saying that “Oops! That page can’t be found. then, where i should go to set up the link? Actually I think you skipped a step when you setup the site. You were supposed to reset your permalinks and I am guessing you didn’t do that. Hi Adam, I have set the permalink to Post name but the image of breakfast, lunch or dinner still does not direct to Menu section page. The resolution for this ended up being not having the website is coming soon mode. When it was made live, everything worked as expected. I would greatly appreciate it if you could assist me in overcoming this predicament. Yea it look like you are trying to add an image to a menu section and unfortunately the theme is not coded to allow you to add an image in that section. What I did in the video was add an image to the menu item, not the menu section. how do you place an order on this site? It’s not setup for online ordering. I would have to look into how to implement that. Hi Adam, this is really cool information that you are providing here. Same as Martins I haven’t received the email to download the resource files. I have also checked the spam. Is there any other way of receiving this info? Thanks a bunch!! I’m sorry Joe, i’ll email you personally right now!!! Hi Adam, please help me out with the template.. I gave in my name and email several times but never receive an email or the link to download the template. Please i want the restaurant theme. Maybe check your spam folder??? I see the email was sent to you. Hi Adam, thank you for these DFY-websites. I have installed both of them in my MAMP and now I can experiment. Also: well done for getting us an installation including the Child theme! Brilliant. Ready for practice and use. One question though. It seems there is a brownish tone underlying the featured pictures. How can I remove or change that color? So you are saying the featured images have a brownish color overlay? Hmm…i’ll have to check for myself. I am sure they are going to work out great for you. You should also check out DesktopServer, which is what I use locally to develop websites. You may run into trouble with Jetpack on a local install though.